Kids home from school with nothing to do? These fun cooking activities are perfect for winter break, and they're a great way to keep kids busy -- no TV or video games needed. From simple rice crispy treats to satisfying party mixes that are perfect for football watching or New Year's Eve parties, these easy cooking activities are great for kids of all ages (obviously, younger kids will need supervision in the kitchen, especially with using knives, stoves and ovens). 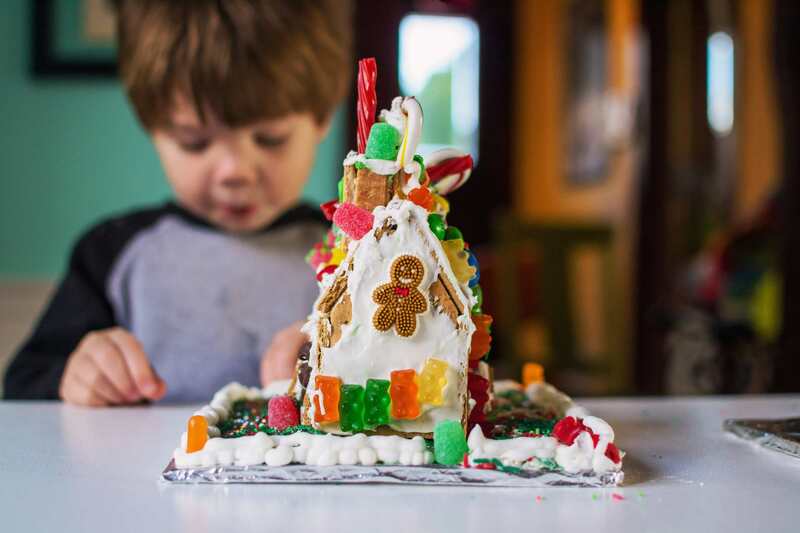 You can either start with a kit - here's a review of my favorite gingerbread house kits - or make your own house from scratch (it's easy when you make a graham cracker gingerbread house). Check out these pictures for gingerbread house decorating ideas. Do you ever find the holiday season almost over and realize you never got a chance to bake with the kids? These holiday rice crispy treats make a great kids cooking activity for winter break. And there's no baking required! This party mix is one of those easy cooking activities that even little kids can handle. And this party mix recipe makes a great afternoon snack. What's more fun than playing out in the snow then coming in with a steamy mug of hot chocolate? Let the kids extend the fun by making the hot chocolate themselves with this easy recipe. This recipe works great in the slow cooker, too. Just mix it up, go build a snowman and when you come back, the homemade hot chocolate will be ready for you. Are the kids tired of basic cooking activities and ready to move up to something really spectacular? This homemade marshmallows recipe is for them. It's easier than you might think, especially if you have a stand mixer (compare prices), but you will need a candy thermometer (compare prices). Once you take your first bite of a homemade marshmallow, you'll never go back to the store-bought kind again! Brownies are a great way to introduce kids to cooking. The recipe can be mixed in one bowl, the finished product is wonderfully rich and sweet, and you can't mess them up (well, unless you overbake them). But overbaking is rarely a problem when I make these brownies as a cooking activity with kids, because their faces are usually pressed right against the oven waiting for them to be done! Banana bread - really, all quick breads - are the perfect cooking activity for beginning bakers. It's easy to make and they love eating their work! Got kids who like playing in the dirt? With this fun cooking activity, they can eat it! This no-bake treat makes an ideal cooking activity for big and little kids. The smell of homemade soft pretzels wafting from the kitchen is warm and homey. And this isn't a hard cooking activity at all - it does, however, require some time. You'll have to start the pretzels several hours before you plan to eat them (this recipe uses a bread machine to make it easy), then when the dough is ready, you can shape and bake the pretzels. This cooking activity is perfect for long winter days when you don't want to go outside.